One of the largest costs of having a commercial swimming pool is paying to warm the water. What if you heated that water for free instead? 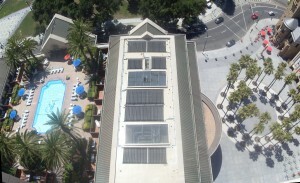 The sun is plentiful in California and that makes it the best locale for solar swimming pool heating designs. And Solaron is the state leader for installations of one of the finest systems available – Heliocol water heating solar panels. Even better, companies do not have to pay the complete cost of installing a solar swimming pool heating system. Considerable rebates are available to help offset the costs involved in using solar heating with multi-family swimming pools. Saving on gas costs and the product installation is a winner for companies in California! Solaron handles all phases of solar swimming pool heating installations in West Sacramento, including design, engineering and permitting. Our workers install the swimming pool heater and our staff makes sure that you receive all applicable rebates. For more information about how Solaron can help you to efficiently warm your recreational pool, contact us today at 916-631-9293.